We have a holiday shortened week ahead of us with markets closed on Friday, but that does not mean its not a busy morning here in Chicago. Let me first say ‘thank you’ to everyone I met in Lubbock, Texas over the last week at the 2017 Texas Cotton Ginners Show. Your hospitality is second to none. I attend quite a few trade shows during the year, it was nice to attend one focused on Ag where the producers were not coming to me head in hand with prices below the cost of production. 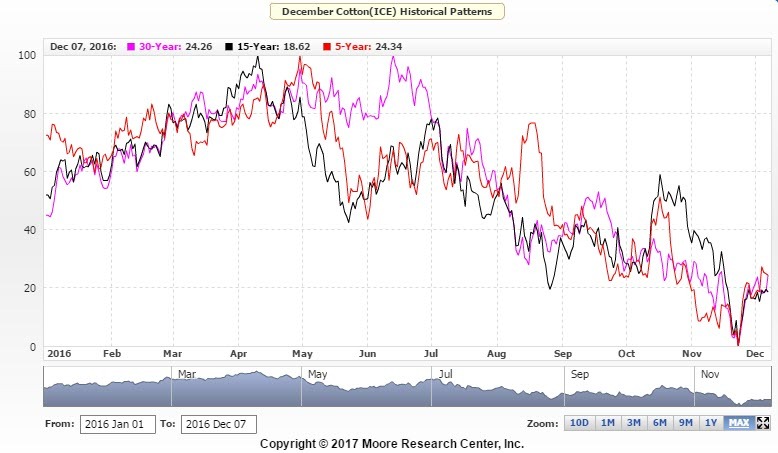 Cotton farmers are quite cheery (maybe its just Texas) at this juncture given the 25% rally over the last year along with fantastic yields to boot. Prices did their part last week to bring some reality though as the fund position begins to un-wind. The week ahead will be focused on WASDE (Tuesday), a wet forecast for Midwestern row crop farmers, the redux of the US/China summit that could be friendly for the US farmers and the continued wrap up of South American Soybean harvests. 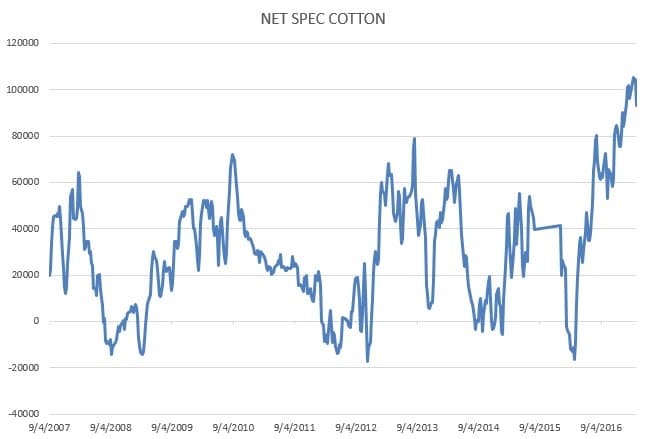 Cotton: Starting with cotton, the retreat from the record spec long position has been realized by prices in recent weeks. I found little on the producer side in cotton who had too much exposed at this time given it has been moved through the gins. I did find a few gins who were waiting to contract old crop. Given all of that, it feels like the spec side will be driving prices over the next few months. We saw Dec post the lowest close since late Jan this last week, and the COT leaves the long side very vulnerable here. The long position is still longer than it was in the past historical run ups, I have a feeling WASDE will provide some bullish inspiration given the outstanding pace of exports, but the increase of acreage is too much to overcome in my opinion. If you are in July puts, I think we want to try to roll down if the prices would give us a chance. We have about 2 months left on July puts and if you can get your investment back while staying short the board, thats the road I would take. Seasonals call for tops made in December sometime between April and June. It will take some production problems to get prices moving above highs, which I do not see in the cards for a while given planting is still weeks away in most places. 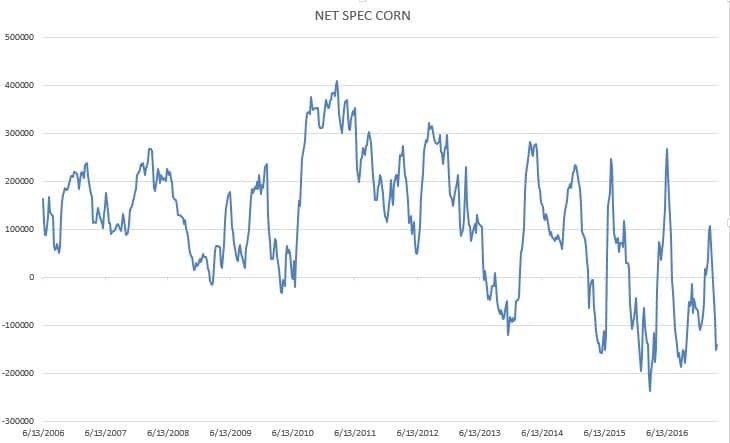 Corn: The market liquidation has been fierce in recent weeks and I think we are poised for a bounce if the USDA does not get too crazy with increases to Brazilian corn estimates. The average trade guess for corn is 2.3 MMT which is really not news, so the prices probably follow the SAM estimates first, followed by a focus on US weather. The forecast over much of the corn belt in the next two weeks is wet, expect planting delay rhetoric. But it is still really early to get too concerned. Given the amount of moisture, any change in forecast to the dry side will put many in a good mood regarding production outlooks. Long term, the US got really good news out of the meeting with China over the weekend. The FT wrote a story yesterday talking about a potential deal involving increased US ag products to China, including US beef. Do yourself a favor and check this out this morning. The market is very myopic right now concerning supply and the weak hands (farmers, need of money) who hold it. Prices reflect such, but if we assume even small demand increases for soybeans, wheat, corn or cotton from China, the market could cover shorts rapidly. I like leaning toward the long side in corn if this report would give you a chance to buy. Here is a recommendation: Buy August SD 400 calls, sell the August SD 450 calls for under a dime. This gives you 50 cents of upside exposure for under a dime. Who knows what weather looks like, this gives you some good help to HTA or sell cash if the market would pop on weather. SOYBEANS: The story is bearish but the COT reports show this is pretty much absorbed. It will be interesting to see how aggressively the US hikes bean production in Brazil, Informa and a few others are already over 110 MMT. The USDA sits at 107 MMT, up from the 103 to start the year. Harvest in Brazil is almost 80% complete. Argentina is facing heavy rains and resulting flooding across key areas. The forecasts going forward should dry out so they can start harvest. The USDA started the year at 59 MMT and sit at 56 MMT right now for Arg. Telluslabs and their satellites are back, with estimates for Argentina at 52 MMT. Last year was the first year they published US data and they came in smaller than the USDA, so this doesnt mean a lot but an 8% skew is something to be aware of. 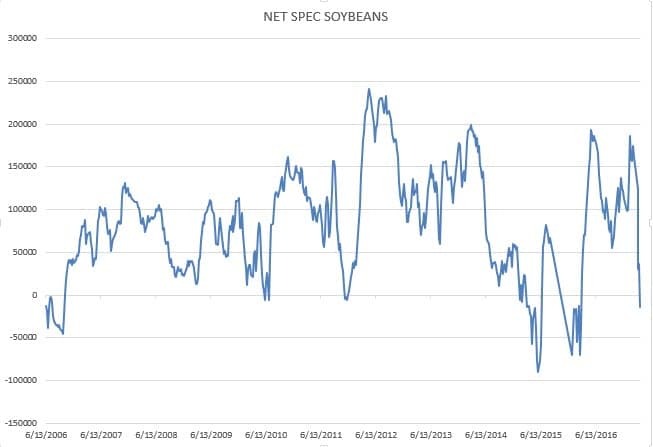 Given the spec position (slightly net short), I would be very careful being too short new crop soy here. The move appears to have been made. I know the story is bearish, but is the big money willing to be short going into US planting? 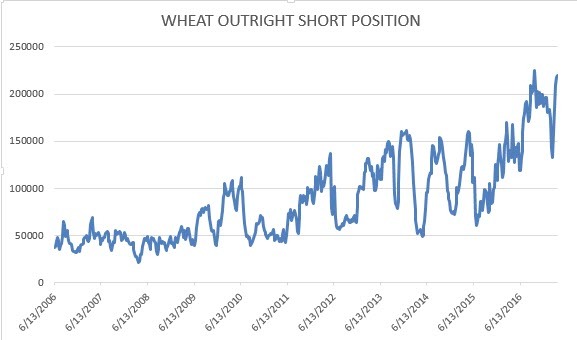 The outright long position is the smallest since March of 2016. WHEAT: I doubt the USDA is too friendly for wheat, they seem to like kicking that dog. Carryout expectations are for 1.129 billion bushels for old crop. New crop projections are probably going up given the idea that this weather has helped conditions. We will learn more this afternoon. There is not much on the horizon to help unless we get a shock from Russia. Black sea wheat production will be lower this year, some say by as much as 7%, but that is coming from a record last year. The only thing I see that is bullish is the COT numbers showing the outright spec short at levels only seen in Oct of last year. This market is probably the biggest powder keg out there if the news flow would change, unfortunately it is far from it at this point. Seasonal short plays end next week, which may cause a bump in prices though.